In the video clip: a game of three-in-a-row with fruits! Reveal each of these fruits, one at a time, to elicit their names from the children: "Una naranja" (An orange); "Una cereza" (A cherry); "Un plátano" (A banana). Then show two oranges and ask: "¿Cuántas naranjas hay?" (How many oranges are there?). Possible replies: "Dos" (Two) or "Dos naranjas" (Two oranges) or "Hay dos naranjas" (There are two oranges). Repeat the process with the other fruits. Give all the children three sheets of paper. On each sheet of paper they draw one of the three fruits (see download for examples they can copy). Then select three children to line up and play a game of 'fruit bingo'. In this game each child turns over one of their papers to reveal a fruit, and the object of the game is to get three fruits in a row. 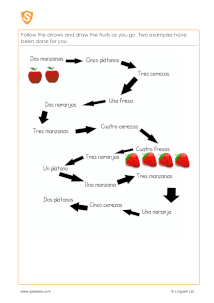 During the game you can use language like: "Dos cerezas y una naranja" (Two cherries and one orange) or "Hay tres naranjas. ¡Fantástico!" 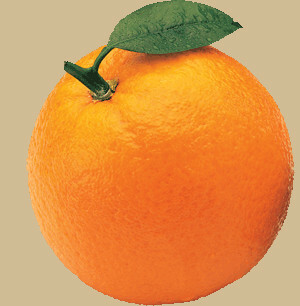 (There are three oranges. Great!). Choose a child to be the bingo 'caller' and play again. ¿Cuántos plátanos hay? ¿kwantoss platahnoss ay? How many bananas are there?